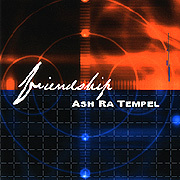 The German group Ash Ra Tempel has existed, in one form or another, since 1970. Countless musicians have cited this seminal band as having serious implications in the way their music is made. At the core of this unit is Manuel Gottsching, leading Ash Ra Tempel from its roots in spacerock, to cosmicmusic, on to a precursor of techno and more recently to a reunion with co-founder Klaus Schulze. On the Ash Ra Tempel studio album: Friendship, Gottsching's guitar melodies and Schulze's synths and percussion are together again with an easy going musical jaunt between two comrades. Individually, they cast a giant shadow. Together, on Friendship, they are found simply enjoying each other's company and music. 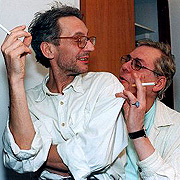 The three lengthy pieces on Friendship are linear, with Schulze's electronic percussion and evocative harmonies leading the listener along the musical path while Gottsching's guitar stylings speak of their surroundings. The mood created is familiar, modern and mature. Listening to Friendship calls to mind that comfort which is felt at a long awaited reunion and the sharing of the past and present.